In 1994, Supreme opened in Manhattan to celebrate the skateboard and artist cultures. As the company and Supreme name grew, it quickly established itself as a brand known for high-quality gear, style and authenticity – all while accumulating a massive following of disciples and collectors who look up to the brand as a cultural reference. Today, Supreme partnered up with Wilson Sporting Goods, who is proud to announce the Supreme Tennis Ball. 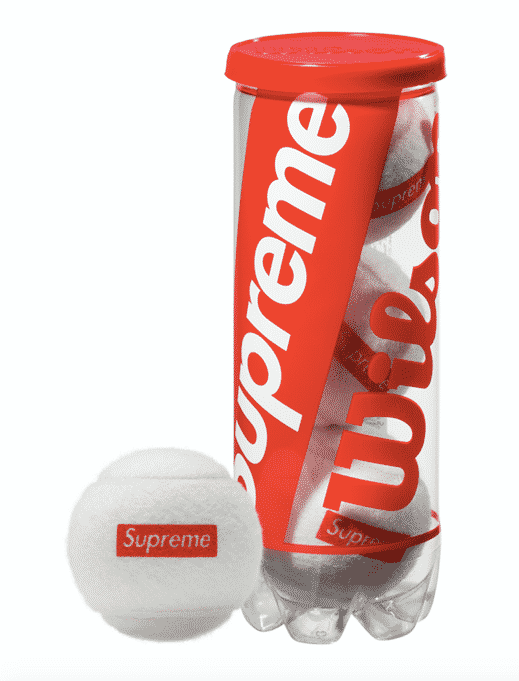 The Supreme Tennis Ball will be sold starting today at Supreme stores in: LA, NYC, Brooklyn, London, Paris, and Japan (Harajuku, Shibuya, Daikanyama, Nagoya, Osaka, and Fukuoka), as well as Dover Street Market in NY. Additionally, it will also be available at the brand’s online web store (http://www.supremenewyork.com/) which sells to the E.U., the U.K., North America, and Japan. Supplies are limited and are expected to sell out soon! Chances are, they’re probably already sold out! Price per can is $16 USD.